WASHINGTON, DC -- U.S. secretary of defense nominee Ashton Carter told a Senate hearing Wednesday that he's "very much inclined" to provide lethal weapons to Ukrainian troops fighting Russian-backed separatists. "We need to support Ukraine in defending themselves," Carter said. 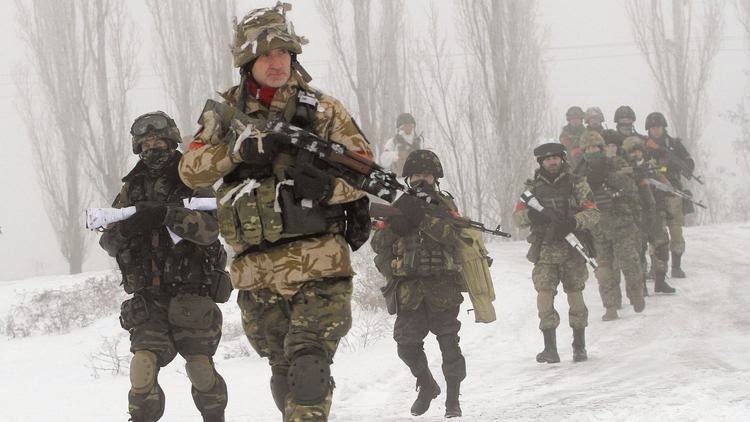 Ukrainian soldiers patrol territory controlled by pro-Russian separatists last week. Russian President Vladimir Putin’s aggression in the former Soviet republic is bound to continue as long as government forces are inadequately armed. We're happy to see that Carter is sprinting ahead of his soon-to-be boss, President Barack Obama, who has been frustratingly reluctant to arm the Ukrainians. We've long urged that move to help the embattled Kiev government stand up to Russian President Vladimir Putin's proxies in eastern Ukraine. Carter isn't some renegade urging the U.S. to arm Ukraine against rebels who enjoy a steady flow of lethal aid from Moscow. U.S. Air Force Gen. Philip Breedlove, currently NATO's military commander, reportedly supports providing an array of defensive weapons to Kiev. Secretary of State John Kerry, national security adviser Susan Rice and Gen. Martin Dempsey, chairman of the Joint Chiefs of Staff, are reported to be open to discussions of arming Ukraine — meaning, we hope, that they are preparing to follow Carter's lead. To the rising arm-Ukraine chorus add former Defense Department star Michele Flournoy, Chicago Council on Global Affairs President Ivo Daalder, former U.S. Ambassador to Ukraine John Herbst and five other former senior American military and diplomatic officials, all of whom urge the U.S. to send $3 billion in defensive weaponry to Ukraine. "Assisting Ukraine to deter attack and defend itself is not inconsistent with the search for a peaceful, political solution — it is essential to achieving it." Obama, however, evidently fears that sending arms would tempt Putin to escalate by tossing more Russian resources into Ukraine. Yes, that's a risk; the conflict conceivably could spill outside Ukraine's borders and require a NATO response. While the U.S. and its allies dither, however, Russia marches. Pro-Russian rebels recently broke a four-month truce and launched a new offensive, capturing a regional airport and firing missiles that killed 30 civilians in the eastern Ukraine city of Mariupol. The rebels appear to be supremely confident and upbeat. They used the truce not to explore a peace deal but to stockpile more arms from Moscow. Putin likely won't be satisfied with last year's conquest of Crimea, one vital component of Ukraine. He wants a larger chunk of Ukraine if not other lands as well. He seeks to recapture Soviet glory. Stoking the conflict in eastern Ukraine keeps the pressure on the West-leaning Ukrainian government. It undercuts the democratically elected leaders there and sends a shiver through other Russian neighbors. Putin isn't deterred by the tough economic sanctions that the European Union and the U.S. have imposed. Nor is he slowed by the tumbling price of oil and his country's crumbling economy. German Chancellor Angela Merkel's scolding hasn't stopped him. His domestic approval rating is stratospherically high. Then again, what would you say to a Russian pollster about the ruthless Putin? Putin dares the West to deliver on its threats of deeper sanctions. In its last meeting, the EU extended current sanctions but showed little appetite to ratchet up the pressure. He'll stop meddling in Ukraine only when the cost exceeds his ability to pay. Strength is a currency Putin respects. 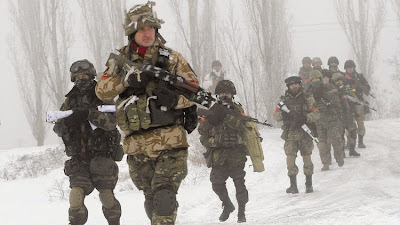 The West has to arm Ukraine to punch back.